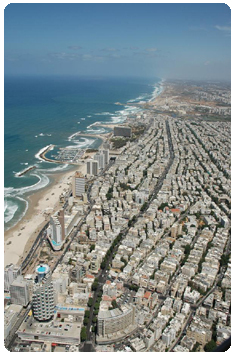 The beautiful white beaches of Tel-Aviv are the city's most popular attraction and a must for any visitor’s itinerary. Restaurants, clubs and entertainment line the renewed promenade and during warm evenings locals stroll along its length. Another popular site along the beachfront is the marina, which is used as an anchorage by scores of boats and yachts. If you are seeking the Middle Eastern atmosphere visit the colorful Carmel Market where vendors sell exotic food products and cheap clothing or go to neighboring Nachalat Binyamin Pedestrian Mall, where artists present their homemade products every Tuesday and Friday. Old Jaffa has become one of Israel's tourist attractions. It is now inhabited by artists' quarters, studios and art galleries. Shops catering for Judaica, archaeology, jewelry and art, line its narrow alleys which are named after the signs of the Zodiac. Old Jaffa in itself is a quaint city, more picturesque than ever, with romantic paths and gardens.